The greatest single loss of aircraft in any one day suffered by any nation involved in the Second World War occurred on 22 June 1941. On that day Germany began Operation Barbarossa, its invasion of the Soviet Union, and by nightfall Soviet aircraft losses amounted to 1811, of which 1489 were destroyed on the ground. 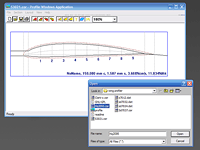 Profile - A great little program to display and print/plot airfoil templates for aircraft designs. — add to this description, use form at right. Easy to use and a great aid to cutting out wing ribs and fitting servos, retracts and the like. Lovely little programme. Used the downloadable aerofoil archive for an NACA0015 aerofoil and then adjusted the chord length to give me the right proportional profile.